Alan Kelly got Week 22 under way on Wednesday night, refereeing Toronto FC versus Real Salt Lake at BMO Field, and it will be down to Ricardo Salazar to get the weekend action started. San Jose Earthquakes take on New York City at Avaya Stadium, which played host to the recent All-Star game against Arsenal of the English Premier League. The Friday night fixture will see Peter Manikowski, Jeffrey Greeson and Juan Guzman is support of the 2011 MLS Cup referee. 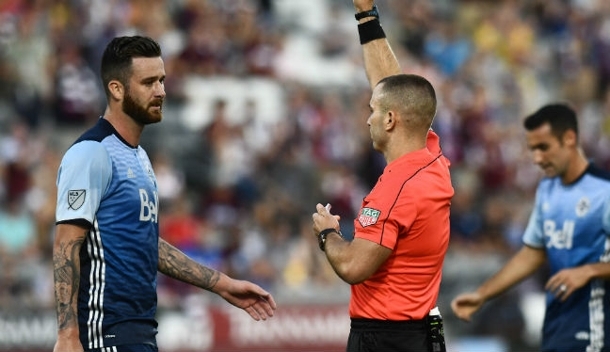 Five games follow on Saturday, with Chris Penso making a return to the MLS middle following his All-Star center assignment – he referees Colorado Rapids against Vancouver Whitecaps, supported by Ian Anderson – the AR earning a league-high 16th assignment. The first of Saturday’s games kicks off at 7pm ET and will be refereed by Jair Marrufo, who was the focus of the latest Play of the Week by PRO’s Training & Development Manager, Paul Rejer. Ted Unkel and Marcos DeOliveira are in Canada, respectively refereeing Toronto FC versus New England Revolution and Montreal Impact’s clash with Houston Dynamo. Silviu Petrescu and his team – consisting of Adam Garner, Mike Rottersman and Armando Villarreal – complete Saturday’s line-up in a 10pm kick-off between Real Salt Lake and Chicago Fire. Three games take place this Sunday, with the MLS Cup and US Open Cup champions meeting at Providence Park. Baldomero Toledo will be the man overseeing Portland Timbers versus Sporting Kansas City, while Allen Chapman is assigned to the other 7pm start – Orlando City v Seattle Sounders. LA Galaxy and New York Red Bulls bring the curtain down on week 22, and the experienced Hilario Grajeda – 2013’s MLS Referee of the Year – will be the man in the middle.